With 3 weeks to go until the Weston A. Price Foundation‘s 2012 Wise Traditions conference, The Appropriate Omnivore continues its series of Wise Traditions speakers. 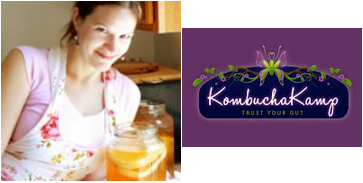 The speaker for this episode is Hannah Crum of Kombucha Kamp. Hannah both brews kombucha and teaches classes on how to make it yourself. Hannah and Aaron discuss how brewing your own kombucha provides superior nourishment. The two also get into the recent controversy of a student being suspended for having kombucha in his lunch box and explain why it’s safe for kids of all age to be drinking kombucha.